The 'horrendous' blaze struck the 27-storey Grenfell Tower in Latimer Road, White City, in the early hours of Wednesday morning. Several people are being treated for a 'range of injuries' including illness from smoke inhalation. One neighbour said he believed someone had jumped from about 10 to 15 floors to escape the fire. The fire has spread from the second floor to the roof of the enormous 120-flat block, with 200 firefighters struggling to bring it under control. We know that there have been fatalities and 74 people were taken to hospital; more than 20 ambulance crews attended. Details will come in over time but the courage of firefighters and local residents is immediately clear. We salute the courage of the firefighters, local residents and ambulance crews who responded with self-sacrificing speed. But as well as huge sympathy and sorrow, there has been a big expression of anger from local people. Members of the Unite housing workers’ branch report that, all over London, residents were this morning approaching housing workers with their fears about the implications. There is real anger that residents’ concerns have not been listened to and that the terrible events may have been avoidable. There has been a history of problems with maintenance of the block and residents have expressed concern at fire safety. Residents’ group Grenfell Action Group said they had repeatedly warned the owners of the block, Kensington and Chelsea Tory council, and Kensington and Chelsea Tenant Management Organisation, which manages the block, about “very poor fire safety standards” in the tower. They claimed their warnings “fell on deaf ears”. Although Kensington and Chelsea is the richest part of the UK, it includes many working class residents. In fact, anger at the housing situation in the borough is one of the factors behind the surprise victory for the Labour candidate, who had campaigned on housing, in last week’s general election. Advice to residents was to stay in their flats in the event of fire because fire insulation would give time for emergency services to reach them. Survivors say how glad they are that they ignored this advice given the speed of spread. 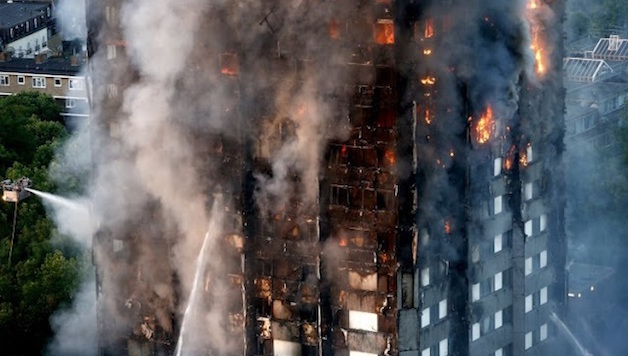 Witnesses speak of the recently fitted outer cladding on the tower catching fire, raising questions about the fire-resistance of the materials – such questions are not new in housing. Notably, the Guardian’s Dawn Foster reports that Rydon, the company responsible for the cladding and retrofitting refurbishments at Grenfell Tower, has scrapped all references to the refurbishment from its website. It was described as an “unprecedented situation” by the London Fire Brigade. Matt Wrack of the firefighters’ union the FBU, on Sky, said it shouldn’t be possible for fire to develop in this way and the union is calling for a major investigation to be made into the building. A call echoed by the Unite housing workers’ branch. As with the recent terrorist attacks, this horrendous event also brings into sharp focus the fact that the number of firefighters has been cut in London by 550, with ten stations closed and others with appliances reduced. The number of fire deaths has risen over the last year and figures for waiting times in accident and emergency departments and ambulance response times have failed to meet targets. NHS services are at breaking point and facing further cuts. The causes of this fire are not yet known but there must be concern that the issues raised point to unacceptable risk around the country. The All-Party Parliamentary Fire Safety and Rescue Group of MPs has been calling for a review of building regulations for years. Failings were uncovered following a devastating tower block fire at Lakanal House in Southwark in 2009, which killed six people. The failings then included a lack of fire risk assessments, and panels on the outside walls not providing the necessary fire resistance. Then housing minister Gavin Barwell said in the Commons last October that the government will review Part B of Building Regulations 2010, which relate to fire safety, “following the Lakanal House fire”. Ronnie King, a former Chief Fire Officer and secretary to the Parliamentary Committee said the building regulations “haven’t taken account of the Lakanal House fire inquest, or updated recent accredited research” (Inside Housing, 7 March 2017). The issue was that cladding to improve heat insulation undermined fire safety. Inside Housing magazine was unable to get a date for the review from the government at that time. Gavin Barwell, the housing minister responsible at the time the building regulations review was delayed, lost his seat in last week’s election and has now been parachuted in as Theresa May’s chief of staff. Simply changing the building regulations would not be an adequate response as existing buildings would need to be reviewed. The cost implications could be significant but austerity cannot be allowed to delay a response. It is essential that the 400-600 people made homeless are rapidly rehoused locally in secure and affordable accommodation. The government must move fast and no talk of lack of money can be accepted in this situation. We need a major investigation into Grenfell House and the implications for housing around the country. That investigation must be genuinely independent of government and must be free to draw out the implications of spending cuts and to make recommendations that do not compromise safety because of austerity. It must be led by trade unions and residents groups drawing on independent expertise. Labour councils should refuse to pass on any further cuts. Stop all privatisation of housing, repairs and renovation! London mayor Sadiq Khan should reverse all cuts to the London fire service. “It’s already quite clear that this isn’t a tragic accident but the predicted and criminal result of the policies of cuts, privatisation, lack of democratic accountability and wilful neglect carried out locally and nationally. “All tenants in social housing in the area and beyond will be thinking about the importance of what’s happened.